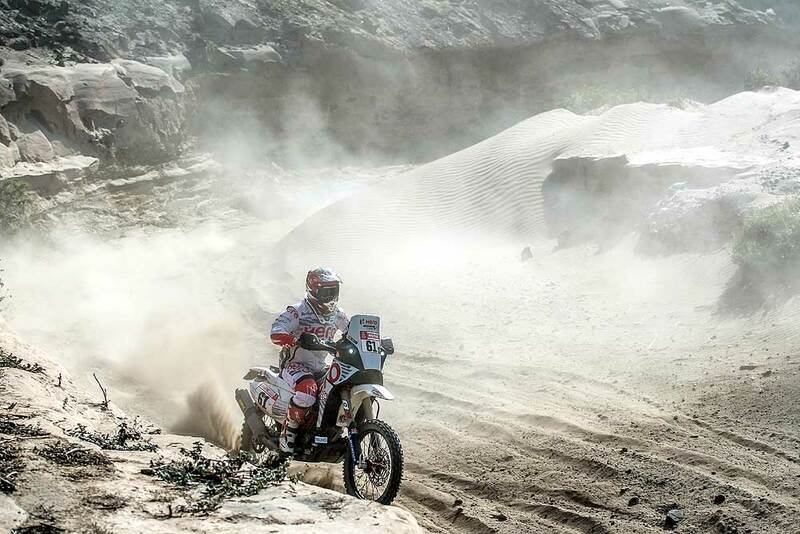 Both the Hero MotoSports Team Rally riders pushed hard to overcome the tough SS04 for the team. The stage, offered a changed landscape and a different kind of start to break the mould. It started on the beach front in a mass start format with 15 bikes per set. Oriol Mena continued his fine form of Monday to begin the stage well with but lost some time in finding a waypoint in the later part of the stage. He finished the stage at 33th position, which now places him at 24th position in the overall rankings. “It was a tough stage," said Oriol Mena. "I lost out on one waypoint and lost nearly 20 minutes to find that. Finally I am here back at the bivouac which is important thing and Wednesday will be another day." CS Santosh came out with a purpose and rode hard to cover a lot of positions despite a nasty crash in the second half of the stage. He gained over 40 positions on his overnight ranking of 98, to finish the stage and overall at 56th place. "We started the stage on the beach," reported CS Santosh. "I knew it was going to be a tough day because I was starting with a lot of riders in front of me. I tried to push myself hard and did all I could and so I managed to cross a lot of riders. Dune section was really long and difficult but I managed that well. Towards the end I had a massive crash because of a rock hidden inside fesh-fesh, but I am ok and the bike is ok so we live to fight another day."